An innovative, user-friendly, powerful analyser and True Peak limiter with a fairly steep price tag but a very bright future. History View is very useful. Wide range of standards supported. Can’t bypass limiter while playing. Founded by two ex-Rockstar North audio developers, Signum Audio’s debut release was a True Peak metering plugin going by the name of Bute Loudness Analyser (£83). Bute Loudness Suite (VST/AU/AAX) is essentially the same thing with a True Peak brickwall limiter added, and bundled with an AudioSuite version (called AudioSuite Normaliser) for quick offline analysis, normalising and rendering in Pro Tools. It’s available in stereo (£240) and surround (£300) versions, the latter up to 7.1. The first thing you do with Bute Loudness Suite is select a preset broadcast, streaming or other loudness/metering standard from an extensive menu, including Apple, Spotify, Tidal and YouTube, as well as EBU R 128, AES, Netflix, etc. The preset establishes the target loudness level, metering algorithm and metering units, and selecting the User preset (of which you can currently have only one) enables all these and more to be manually adjusted in the Settings page - see Under the hood. The Integrated Loudness panel shows the average loudness of the incoming audio, while the green/red Target Indicator next door shows how far above or below the target level it is. The Range field shows the dynamic range of the source material over its duration. The four vertical meters and their associated numeric display panels give real-time analysis of True Peak, Short Term (over the last three seconds) and Momentary (the last 400ms) loudness, and RMS levels, in LUFS/LKFS/dBTP/ dBFS, depending on the preset. Metering is switchable between absolute and relative, and dragging up and down on the vertical meter scale zooms it, the meters and the History Graph (see below) in and out. The True Peak and Short Term panels have red ‘over’ warning indicators, and a toggle below alternates all four panels between current and maximum values. Opening the Settings page reveals a variety of parameters for the selected standard preset, but, of course, without the option to change them. With the User preset loaded, though, they all become available for editing. The controls include menus for Loudness Units and Full Scale Loudness Units (LUFS, LKFS, DBFS, LEQM), Integrated Gating Type and Filter (BS1770 or LEQM), and value fields for target loudness and tolerance range, True Peak and Short Term Limits, and RMS Window Length. In other words, all the boundaries, measurements and ranges that come together to make a loudness standard. The surround version also has a comprehensive menu of channel configurations. Also in the Settings page, Custom Alerts is a clever system (edited and stored as part of each preset) for drawing attention to user-defined metering violations. Using the sliders, upper and lower thresholds are manually set for the Short Term, Momentary and RMS meters, and an upper limit for the True Peak meter. Whenever the min or max level for a meter is exceeded/undershot, a yellow indicator lights up in its numeric display, a marker appears in the History View, and an up/down correction indicator appears in the graph tooltip. The interface is dominated by the excellent History View, which captures the movement of the four meters as a layered series of colour-matched graphs on a timeline in a zoomable display, with a full-length overview above for navigation, and an overview of the overview for really long media projects. Mousing over a meter’s numeric panel brings its associated graph to the visual fore, and clicking the panel hides or reveals it. A tooltip displays the values for all four meters at the current mouse position in the graph. The History View can do its thing synced to the host DAW or not. If unsynced, a Play button has to be engaged for it to capture the input; most of the time, though, you’ll want to use it synced, so that it locks to the timeline of your track or video project. Indeed, the History View becomes part of the project itself, as it’s saved with the plugin for recall between sessions. Beware: accidentally clicking the DAW sync toggle switch or history refresh button wipes it instantly - perhaps these should have optional confirmation dialogs or be set back a layer. So, you play your program material through once to create a composite loudness graph, then make any tweaks in your DAW’s mixer, based on the metering information given and the helpful red over/error indicators in the overview(s) and main view, which give great positional insight into problem areas. Playing through again overwrites the initial graph in real time with the newly generated one, as the playhead rolls through it, making comparison between the first (in front of the playhead) and second (behind the playhead) graphs easy. If you need to store a graph for later retrieval, you can save it out as a session data file, and CSV export of timestamped loudness values across the project is also supported. Incidentally, the whole GUI is freely resizable, and can be folded down to a tiny window that loses the meters and History View. Tidy. So far we’ve been effectively describing Signum’s Bute Loudness Analyser plugin, which you can get for just over a third of the price of Bute Loudness Suite. It’s the addition of a True Peak brickwall limiter and AudioSuite Normaliser that make this a ‘Suite’... so are they worth the extra? 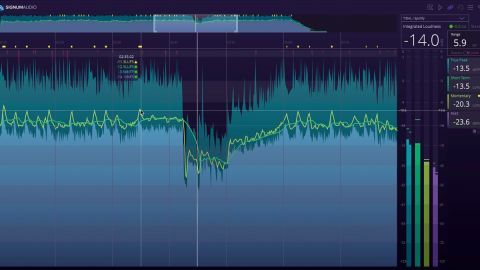 Rather than the usual envelope-controlled compression process, the limiter keeps the signal within the rules of the selected standard using a waveshaping algorithm, which makes it exceptionally transparent and ensures that no peaks ever get through. AudioSuite Normaliser, meanwhile, gives Pro Tools users a very handy workflow for bashing out standard-adherent, consistent masters in no time at all. On the down side, bypassing/unbypassing the limiter can only be done while the project is in stop mode (for PDC-related reasons), and erases the metering and History View. Signum tells us that both are on the table for attention in an update. As to the question of value for money, we’d describe BLS as relatively pricey for what you get, especially - obviously - if you don’t use Pro Tools. Signum has big plans for it, including the porting of AudioSuite Normaliser to a standalone app, the extraction of the limiter to a separate plugin, the addition of a ‘conventional’ limiter, and a raft of improvements to the main plugin; but as it currently stands, non-Pro Tools users in particular are going to wonder why they can’t just buy the main plugin for much less. That aside, this is one of the most intuitive, informative and transparent limiters around, and we look forward to seeing how that roadmap unfolds.